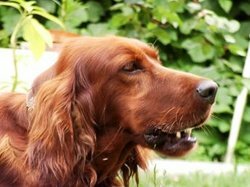 The Irish Setter, also known as the Red Setter, is a breed of gundog. The breed was developed in Ireland in the 1700s from the Old Spanish Pointer, setting spaniels, and early Scottish setters. Its name in Gaelic is Modder rhu or "red dog". Originally, the Irish Setter was bred for hunting, specifically for setting or pointing upland gamebirds. They are similar to other members of the setter family such as the English Setter and Gordon Setter. Today, the Irish Setter is more commonly found as a companion and family pet. The coat is moderately long and silky and of a deep red color, and it requires maintenance. The undercoat is abundant in winter weather. Irish Setters range in height from 25 to 27 inches (64-69 cm), and weigh 60 to 70 pounds (27-32 kg). This happy, playful breed is known for its joie de vivre and thrives on activity. It is faster and has more endurance than other setter breeds. In general, Irish Setters are friendly, enjoy human company, and actively look for other dogs with which to play. They are excellent with children. Due to the breed's need for frequent activity, this is an inappropriate dog for inactive families or apartment dwellers. Bus Éireann, the national bus company in the Republic of Ireland, uses the Red Setter as its corporate logo.